Here Pearl sits, posed with paws crossed. This afternoon she'll be getting a little visitor. 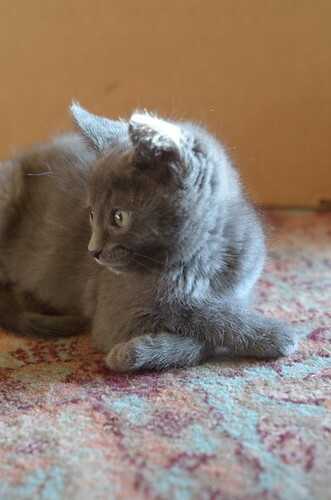 Opal the Human (not Opal the Kitten) will be coming by to meet this little kitten she named. We're all looking forward to her visit. Pearl is such a pretty girl, very dainty. Pearl the kitten and Opal the Human (not Opal the kittne) - can't wait to see the pics!! Any change Peal will soon be Opal's??? That would be too much! Will we get to see pix of the Pearl and Opal (the Human) meet-and-greet?! Please? Ms. Charlene Butterbean's School for kitten deportment does wonders! Pearl poses prettily, paws precisely placed. I love it that Laurie has named Opal the human, "Opal the human not Opal the kitten". But then, I love everything that Laurie does. I always get a little teary when you mention Opal the Human (not Opal the Kitten). It's touching to see such kindness and generosity in anyone, but especially so in one that young! Whoa. . . that redirect was a surprise! Did we know about the move, and I missed the notice? Nice to find little Pearl properly posed, though I had seen her before, just not commented.